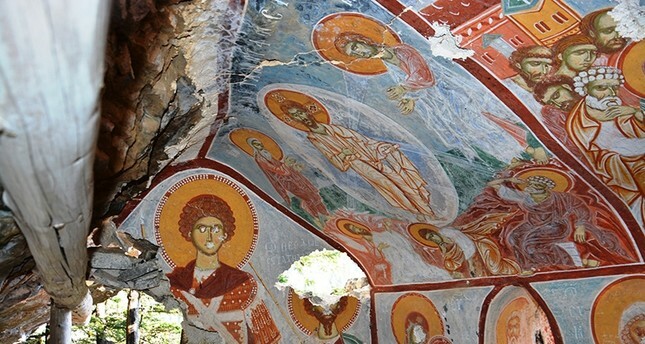 A chapel only accessible through a hidden passage has been discovered during the restoration of historic Sümela Monastery in Turkey's northern Trabzon province on the Black Sea coast. Work has immediately been launched to reveal the chapel and open it for visitors, Doğan News Agency reported Saturday. Renovation work at the Greek Orthodox monastery dedicated to Virgin Mary was launched two years ago. Welcoming over 600,000 visitors annually, Sümela is located in Trabzon's Maçka district, within the Pontic Mountains range, at an altitude of 1,200 meters (3,900ft). The newly discovered chapel reportedly has different murals depicting the "heaven and hell, and death and life." Trabzon Culture and Tourism Director Ali Ayvazoğlu said that they will have some surprises for the visitors after all renovation work is complete. "Visitors will have the opportunity to see places they were previously unable to visit," Ayvazoğlu said, adding that they are employing all means of technology to make sure that the restorations are made without repeating the past mistakes. Maçka Mayor Koray Koçhan said that the chapel will be accessible to visitors, who will climb up a secret passage through corridors and use wooden ladders to reach it. He noted that the murals in the chapel are authentic and are in very good condition. Officials expect a significant boost to tourism in the region, as the monastery attracts hundreds of thousands of visitors.